We're Growing - Our New Website is ePestControl.com! Guaranteed Lowest Prices Including Shipping Anywhere On The Internet! 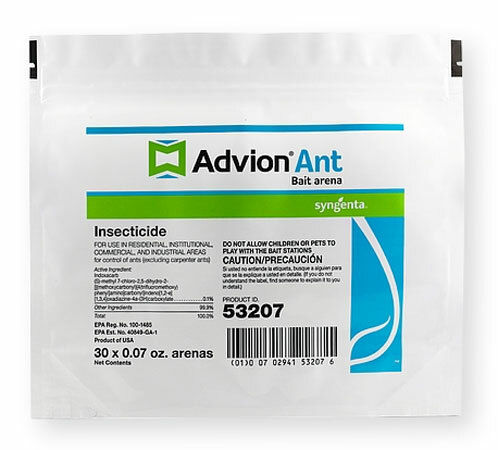 Don't Buy Argentine Ant Baits From Lowes Or Home Depot! 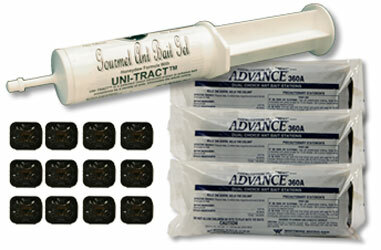 Most over the counter baits sold at hardware stores and retailers do not contain the same attractants or active ingredients as professional use baits. Although the packaging and advertising may appear convincing, millions of dollars are wasted by consumers annually on over the counter ant bait products that simply do not work. For this reason, epestsupply is committed to offering only the finest Professional Quality ant bait products and at the lowest possible price. You can depend on epestsupply and our commitment. Argentine Ants were originally found in the early 1800's. In The USA, they have been found as far west as Washington State and Montana. They are abundant along the northern and southern California coast and into Arizona. 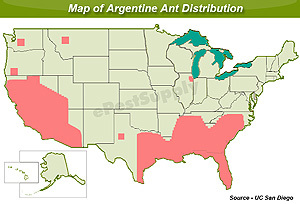 Argentine ants are also very heavily populated from Texas to Florida and along the eastern seaboard. They have even been found in Illinois. The Argentine ant is a small, light to dark brown ant about 1/8 inch (2.6mm) in length. They have been reported to crawl onto people and bite them while they are asleep. Reports from the early 1800's describe babies being attacked in their cribs. Argentine Ants or Linepithema humile were first identified in 1866 near Buenos Aires, Argentina. All Argentine Ants are a dullish brown color in appearance. They feature an uneven thorax with an erect petiole node directly behind the thorax. These two features are the main identifiers of the Argentine Ant. They also feature segmented antennae which have 12 elbowed segments. The worker argentine ants do not have wings and are generally lightly spotted. They can be anywhere from 1/12 of an inch to 1/8 of an inch in length. 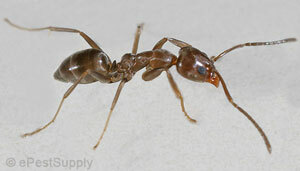 The queen Argentine Ants can be double to quadruple the length of the workers! Queens may also possess wings too, but won’t swarm when mating like most other species of ants. Argentine Ants have been widely distributed since their discovery in the late 1800s. They can currently be found in approximately 15 countries, as well as, some islands and on six continents. In the United States, they are primarily found in Southern California but have also been found in the following states: Tennessee, Georgia, Louisiana, Texas, Alabama, Missouri, North Carolina, South Carolina, Arkansas, Illinois, Oregon and Mississippi. While Argentine Ants are tolerant of each other, they are still very aggressive in nature towards other species of ants and insects. When colonies of Argentine Ants move in to an area, they will kill and run off the other ant species and claim the area for themselves. This tendency has caused a major problem for the horned lizards in Southern California. Horned lizards depend on harvester ants for food. However, when the Argentine Ants moved into the area, they began to eliminate the harvester ants, which has contributed to the decrease of horned lizards in the area. The other contributing factor is that Argentine Ants have been known to attack horned lizards if they are living in the right habitat for a colony of Argentine Ants to also reside. These ants have also been known to successfully attack killer bees and wasp nests. Argentine Ants are unique for a number of reasons, but one of the most unique characteristics about them is the fact that they are tolerant of other Argentine Ant colonies nearby. The way these "Super Colony's" are formed is when a single colony gets too large. The Queen ants will mate inside the nest and then leave the nest with a group of worker ants and start a new colony. These colonies have been known to be very close to others, they will even share workers at times. And, if needed, the individual colonies will team up with one another to attack enemies. 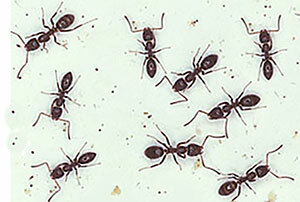 In Argentine Ant colonies, there may be more than one Queen ant. In fact, for every 1,000 workers, there can be up to fifteen (15) Queens! The Queen ants will mate with the males to populate the colony. This is the sole purpose of the male ants – to mate. They generally live for a year and once they have mated, they die. 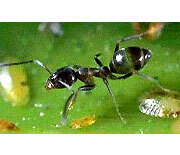 The eggs that the Queens lay are usually sterile female worker ants. The sterile female workers have a variety of responsibilities that include nursing eggs, foraging for food, feeding the larvae and even tending aphids for their honeydew secretions. Argentine ants have multiple queen colonies and the queens will often be found along argentine ant trails. Occasionally, winged queens will be seen in a colony. The Argentine ant is important because it is ideally suited to urban environments. Where it occurs, it can be one of the most difficult pest ants to control. Argentine Ant colonies are "unicolonial" (K. Kupfer - KM Ant Pro). A single colony of Argentine ants can contain thousands of workers and hundreds of queens. These colonies often intertwine and connect with each other, this is what makes control so difficult. The queens in an Argentine ant colony live about 1 year. A typical colony consists of about 90% workers and 10% Queens. In addition to their appearance, Argentine Ants can be identified by the smell they produce when they are crushed. When crushed in large numbers, these ants will give off a musty smell. Because of this musty smell, the Argentine ant is most often confused with the odorous house ant. But the node on the abdomen of the Argentine ant has a sharp, pointed peak, while that of the odorous house ant is flat in shape and is hidden. It may also resemble the Crazy ant and the Small Honey ant, however, the Argentine ant does not have a small circle of hairs on the tip of its abdomen. The first thing you should do when you notice Argentine Ants in and around your home is trim the trees and vegetation that brushes up against the home. Vegetation retains moisture, which attracts Argentine Ants, and if they can use these plants to enter into your home they will. You should also thoroughly inspect the inside and outside of your home for tiny crevices and cracks where the ants can enter from. Once you find them, seal them up. In order to control Argentine Ants, you will need to find good baits such as Gourmet Liquid Ant Bait that are slow-acting. This will ensure that the workers have time to return to the colony with the poison and distribute it. This will kill the colony from within, including the Queen ants. Pesticide sprays will only kill the worker ants and not penetrate the core of the colony. Additionally, when using sprays, you may actually stress out the colony which can cause the Queens to lay even more eggs for colony preservation. The only problem with using liquid ant baits, is that there is only 1 liquid ant bait dispenser ever developed that works. Ken Kupfer at KM Ant Pro has been researching and developing the KM Ant Pro Ant Bait Dispenser since 2000. His liquid ant bait feeding stations are widely in use across southern California, Texas, and Florida. Outdoor baiting with the KM Ant Pro Ant Liquid Ant Bait Station with Gourmet Liquid Ant Bait is the most effective. This combination has been under evaluation by the USDA, several Universities as well as many Vineyards in the California NAPA Valley and provides the best long term control of argentine ants. Indoors, treatment of wall voids with BorActin Dust usually can provide results, although it usually takes several weeks to months to get control. 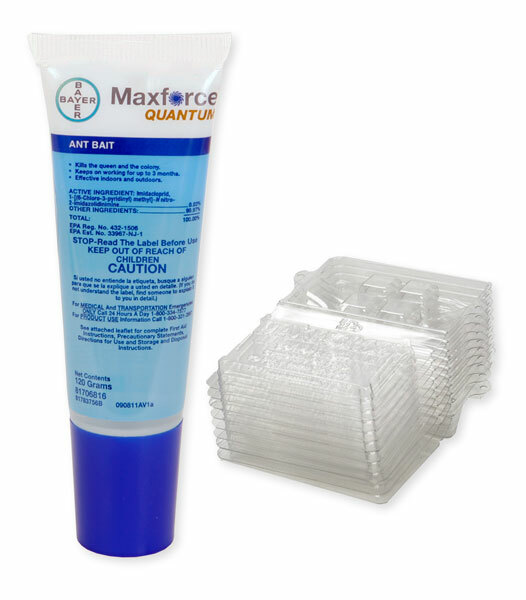 Repeated applications may also be necessary to "dust" areas where ants are seen or found. . Indoor baiting with or Advion Ant Gel can also effective. No indoor treatment is 100% effective, because Argentine Ants live and forage primarly outdoors. 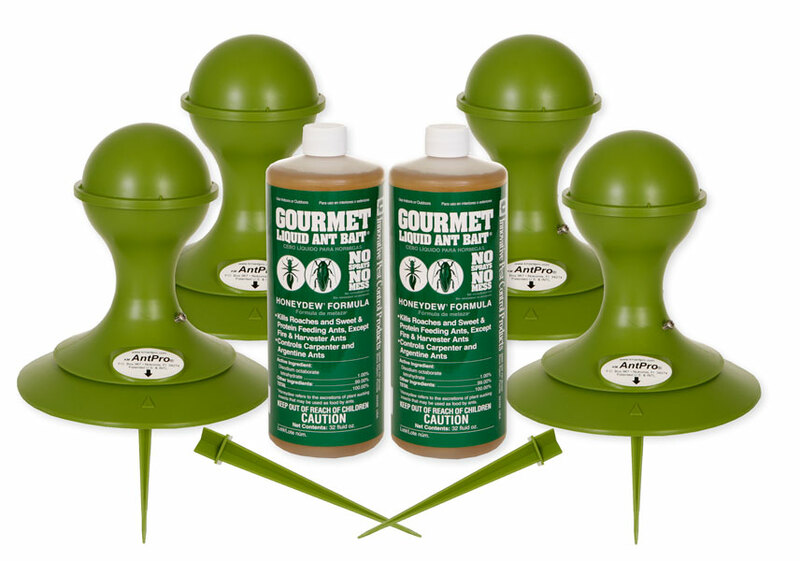 Unless you treat outdoors continually, with a long term outdoor spray program (not recommended), you will have to use a baiting system such as the KM Ant Pro Ant Liquid Ant Bait Station with Gourmet Liquid Ant Bait. This system provides 24/7 feeding for Argentine ants and is used by hundreds of thousands of homeowners as well as numerous Citrus growers, farmers and agricultural companies all across the Southern Coast States. Given time this system will control indoor ants, and also provide a natural food source for future invading ants. Don't worry, the KM Ant Pro System won't attract Argentine Ants, but it does provide a food source for existing ants. Read more about the KM Ant Pro System Here. Don'ts - Do not spray any repellent spray pesticides around Argentine Ants. Spraying will not kill the queens and will increase egg laying. This will compound the problem and make it many times worse. 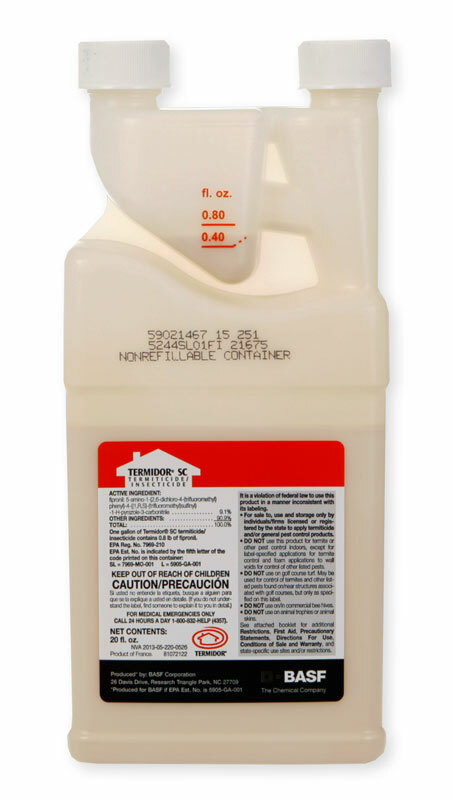 Kills hard to control invasive ants such as argentine, carpenter, ghost, white footed, crazy, fire ants and others! Pest Control companies charge up to $500 a year or more to install and service this system. 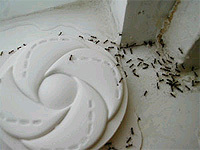 Use 1 KM Ant Pro Unit on each side of home or building, replace bait every 90 days - SAVE HUNDREDS! Controls indoor ants with baits instead of sprays! pharoah, thief, argentine ants and more! condominiums, offices and small businesses. Only $29.95 - Save $6.90!